Grrrrrf. In case you don't understand that, it means "hello again." This is Pluckie. I blogged here before, a while ago. I'm a dog, and I'm told I'm good luck to humans because I'm black and white. I'm also told I'm a spaniel-terrier mix. 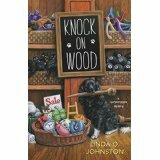 And now I'm appearing again in the second Superstition Mystery, Knock on Wood. I have to say that I'm a lot more relaxed in this story. In the first one, Lost Under A Ladder, I proved myself as lucky to people because I saved the life of the very nice human who owns the Lucky Dog Boutique. After that, my own person Rory Chasen decided to stay here, in Destiny, California, to run that store. And now her good friend Gemma Grayfield is staying here, too. She's running the Broken Mirror Bookstore next door. She's a very nice lady--although some humans said she killed somebody. From what I understand, her old boyfriend followed her to Destiny, but she didn't want anything to do with him. She was trying to find a new boyfriend. One of them was a bigwig in this town, and he made a lot of noise because he knocked on wood a lot. Humans say that brings good luck, but not to that guy. He wound up dead, and people said Gemma did it. Because she's Rory's friend, my person had to try to figure out what really happened. That sometimes put Rory into danger, but I always tried to stay by her side and help. Well, I'd like a treat now so I think I'll go find Rory. Like she said last time, if you want to know more about what happened, you'll need to read about it--this time in Knock on Wood. Also like last time, Rory also says it may be good luck to read it--especially when that strange human holiday called Halloween is soon. Rory is lucky to have you with her. I hope you enjoy Halloween and all of the little trick or treaters. Thank you, Jen. And I will try not to bark too much at those strange-looking little humans. Last Halloween, Willow dressed us up in costumes. What was that about? But we liked it when so many kids came to the door to see us and bring treats! Not sure I'd like getting dressed in costumes, Sally-Forth and Tally-Ho, but I'd do it for more treats. My dog would do pretty much anything for a treat! I do have some limits, holdenj, but not many.